Since 2009, we have been teaching graduate students the design basics needed to create research presentation materials such as slides and posters. The course aims to provide students with the ability to create posters for presentations at academic conferences. We focused on research materials because the need to make research presentations at academic conferences increases as Japanese students reach the graduate level. Clarity and visibility are more important than the visual impact when designing research materials. For business presentations and advertising, there is a need for high-quality visually stimulating slides, such as large photos, flashy illustrations, and animation. However, academic materials require clear design and easy-to-read content. We proposed an additional workshop in which students could acquire poster design skills. In this workshop, students were able to get feedback on how others saw their own layouts from a “third person perspective” and learnt how to achieve the sense of balance necessary for effective poster design. It became apparent that the students needed to more thoroughly understand the concepts of design and not just learn a set of rules. The workshop had very positive effects on subsequent poster designs. The students were able to identify the incomprehensible aspects of their own poster design in the workshop. This understanding has enabled them to work independently and improve their own poster designs when preparing their own research posters. Since 2009, we have been teaching graduate students the design basics needed to create research presentation materials such as slides and posters. The course aims to provide students with the ability to create posters for presentations at academic conferences. In 2013, we authored a textbook on poster and presentation design for such purpose. We focused on research materials because the need to make research presentations at academic conferences increases as Japanese students reach the graduate level. Despite this needs, it was found that many students had limited design skills because there had been few opportunities for them to learn design for education before they entered university. 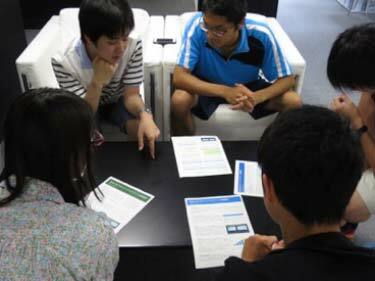 Therefore, there was a need to the students how to design materials higher-education research materials. Clarity and visibility are more important than the visual impact when designing research materials. For business presentations and advertisings, there is a need for high-quality visually stimulating slides, such as large photos, flashy illustrations, and animation. However, academic materials required a clear design and easy-to-read content. Consequently, it is not appropriate for students to refer to business presentation designs as business and research presentations have vastly different purpose. In particular, research posters need to be able to stand out among many other poster presentations on display. 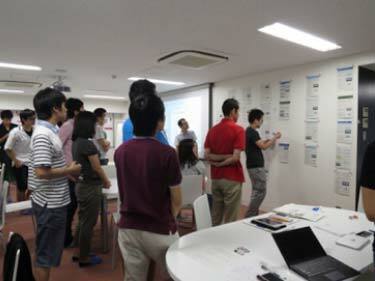 Therefore, we developed and implemented an intensive poster design course for graduate students. This course enables effective learning because it combines lectures of design basics with practice on the relevant software, which enables students to concretely learn the theory and practical skills necessary for effective research poster design. We proposed an additional workshop in which students could acquire poster design skills. This workshop was added to the lecture-based and practical learning components of our poster design class. In this workshop, students were able to get feedback on how others saw their own layouts from a “third person perspective” and learnt how to achieve the sense of balance necessary for effective poster design. This understanding enabled them to independently work on improving their own poster designs when preparing research presentations. This paper reports how this workshop was conducted, discusses the results, and gives an overall evaluation of the success of this addition to the course. The course, “Visual Design of Research” is offered every summer for graduate students majoring in science at Nagoya University. The course contents are presented in Table1. The classes are held over two days: the first class is a lecturer focusing on design basics, the second to fifth classes are practical sessions focusing on designing posters, and the last class is a session dealing with student reviews. The specific course contents of the basics of graphic design are divided into layout and appearance (Table 2). Unfortunately, during the 2014 course, we were unable to adequately impart certain essential design components such as alignment, layout balance, and color schemes to our students. It was difficult to develop simple creation rules for these components because they heavily depended on the content and quantity of information in each poster. It was very difficult for students to devote sufficient time to mastering poster design. A judgment of good or bad in these cases was relatively easy for beginners because the visual differences were clear, as described the following list. However, there was some incomprehensible content, as in the following list. Where the visual differences were not readily obvious, it was important for students to learn to notice these small differences. Here, we show some examples of the posters, designed by students of the 2014 course that needed improvement (Fig 3). These posters were well designed; however, there were some problems in the layout details and the appearance. For example, the contrast in the title and the heading was too low, the margins were too narrow between the heading and the border, and there was inadequate alignment between the left and right sides of the column. Fig 3a. Examples of posters designed by students in 2014. Fig 3b. Examples of posters designed by students in 2014. It became apparent that the students needed to more thoroughly understand the concepts of design and not just learn a set of rules. Generally, an experience in creating multiple posters is necessary to fully master such challenging aspects. In this study, we discuss a workshop in which students can learn a sense for poster layout balance within a short time. This workshop can be added to the lecture-based and experiential learning and enables the students to become acquainted with the various perspectives of the other students by cooperatively solving multiple issues. 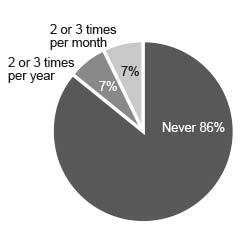 This table shows the course content of the 2015 course. We added the workshop to Day 2 of the first class. The workshop model has three steps: design, discussion, and reflection. First, for the design component, students individually solve the layout issues assigned to them. Then, students form groups and explain and discuss their designs. By exchanging opinions with other students regarding comprehensibility, students receive a third-person perspective on their own design knowledge. Finally, in the reflection phase after seeing and discussing the posters of other groups, students revise their own posters. We provided poster data, which had the same content for all students and was suitable for A4-size paper (Fig 4). It was then easy to compare ideas between the students. 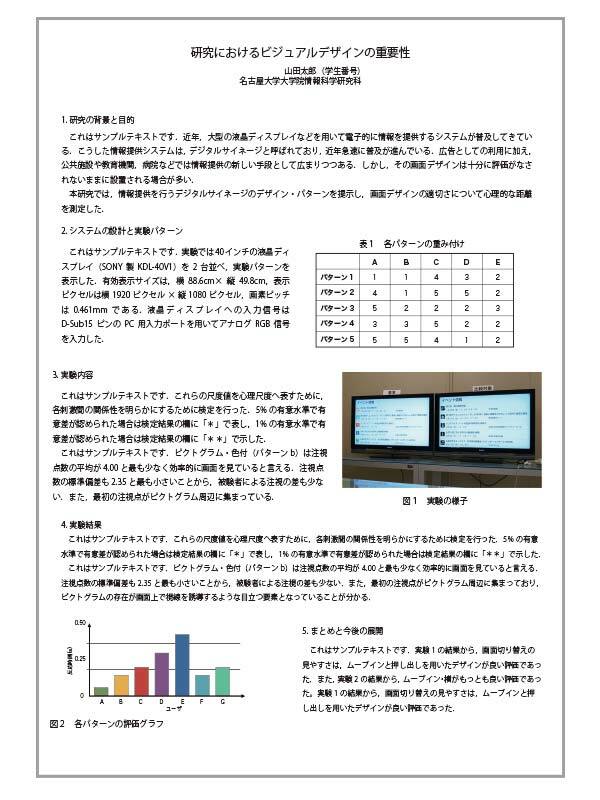 The poster data had five sections of dummy text in Japanese, a picture, a table, and a graph. The reason we used A4-size paper was to facilitate the printing of the students’ work and it was easier for them to view and discuss each other’s work during the workshop. 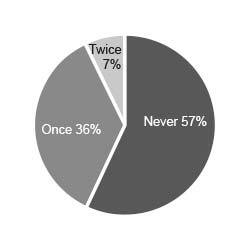 Fig 4. Prepared poster data. Fig 5 shows that the flow of this workshop contains two steps. The first step involved designing the layout and a discussion in which the students discussed each other’s layouts (Fig 6). After the discussion, the posters were displayed on the wall (Fig 7). The second step was designing the appearance, which was again followed by a discussion on their posters after which they revised and printed their posters (Fig 8). 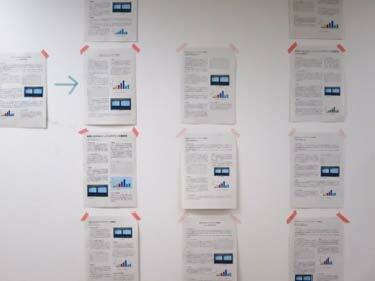 We put the posters on the wall again so that they could view each other’s work (Fig 9, 10). To check the reaction to the course with the included workshop, we conducted questionnaires after the completion of the course. 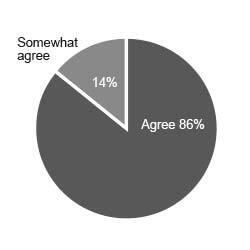 These charts show the results of the questionnaire to which 14 students responded. 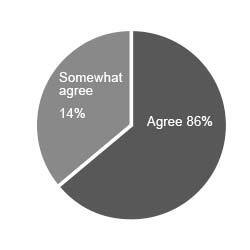 Some examples from the responses to Question 5 are as follows. After the workshop, the students designed their own research posters (Fig 15). The effects of the workshop should become visible after the course as the students contributed to improve aspects of their own posters, such as alignment, color schemes, and layout balance. The workshop had very positive effects on subsequent poster designs. The addition of this workshop has given students a chance to understand how others view their designs. Therefore, students were able to identify the incomprehensible aspects of their own poster design in a limited time period. This understanding has now enabled them to work independently and improve their own poster designs when preparing their own research posters. The intensive course involving the workshop was the first attempt at course improvement. From the results of the questionnaire and the student’s poster designs, the workshop was highly successful. However, there was no lecture included as a part of the workshop: hence, we expect that after a more detailed investigation of the effect of the workshop, we may increase the number of lectures in the future. We plan to revise the content of our text after aggregating the final results. Garr Reynolds. (2011). Presentation Zen: Simple Ideas on Presentation Design and Delivery (2nd ed.). New Riders Press. Robin Williams. (2014). The Non-Designer’s Design Book (2nd ed.). Peachpit Press. Sayoko Tanaka. (2013). Visual Design Handbook for Scientists. Tsukuba University. Dr. Peter J. Gosling, Ph.D. (1999). Scientist’s Guide to Poster Presentation. Kluwer Academic, Plenum Publishers. Kazuji Mogi, Ueda Nobuyuki, Kariyado Toshibumi, Sato Yuuka, Miyata Yoshiro. (2010). Workshop for Cooperation and Expression [Kyoudo to Hyouogen no Workshop]. Toshindo Publishing. Yuhei Yamauchi, Rina Mori, Yuki Anzai. (2013). Workshop Design. Keiko University Press.